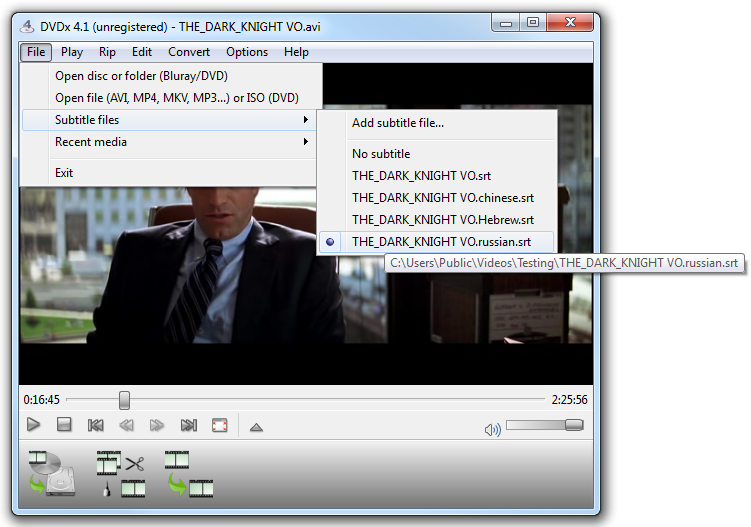 First you must load movie file in DVDx 4.1, either from File menu, either with drag'n'drop file into the player (full-featured player to preview movies). From the File menu, choose Open file... or previous file from Recent media menu. The file will start playing while the converter is analyzing the file streams. You can also drag and drop the files into the player. The file will start playing while the converter is analyzing the file streams. 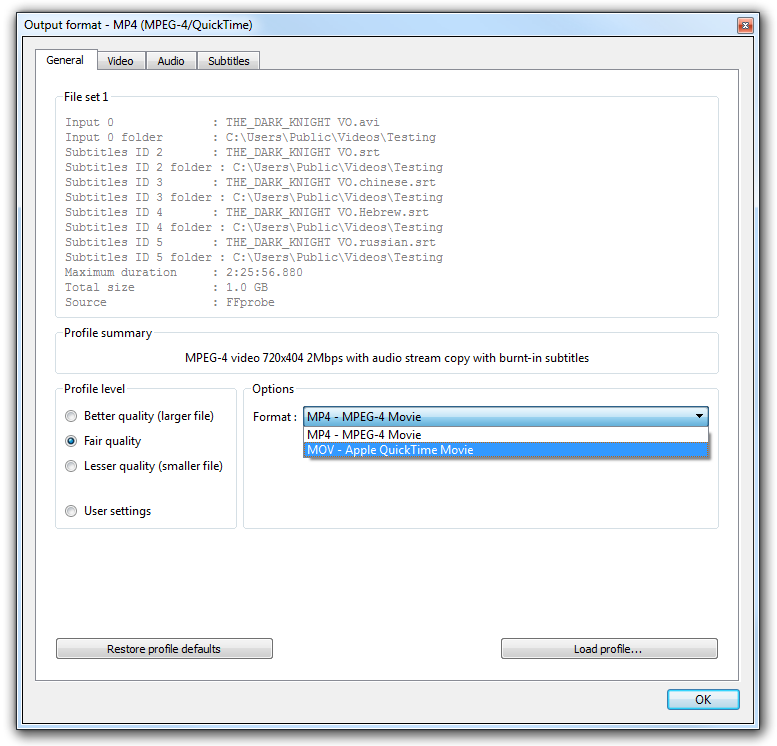 An OSD message File loaded in video converter informs you that converter is ready. 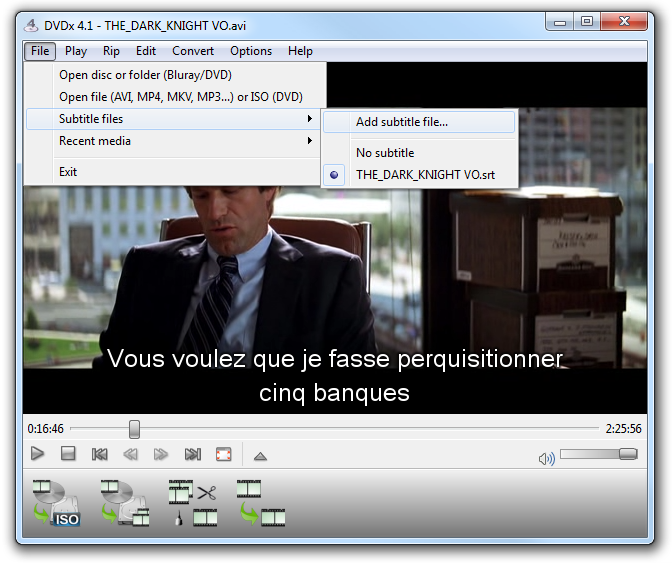 To add a subtitles file into current converter files, you can also drag and drop the subtitles file into the player (the same way you drag and drop a movie). 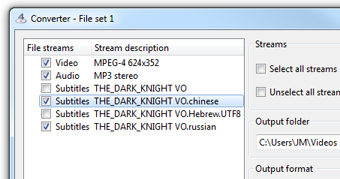 You can choose the subtitles file in the player then you're sure the stream you see in playback is selected in the converter file set. However you can choose only 1 subtitle track to playback, so multiple selections will be done in the converter (like described hereafter). 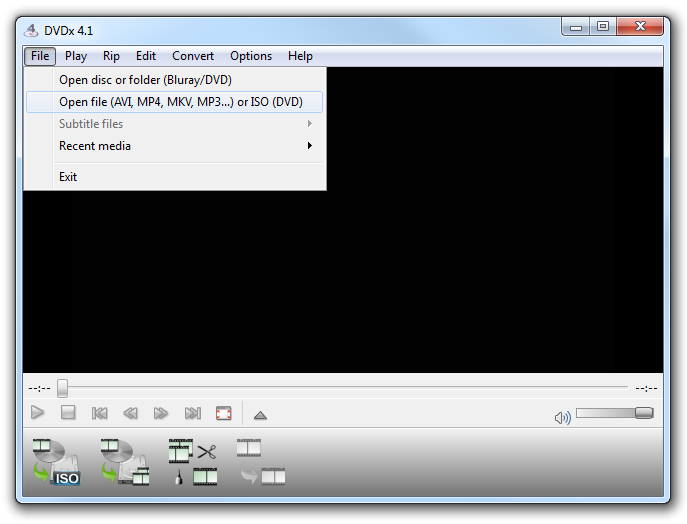 Then open current file set in the converter from Convert menu, choose Transcode current file. Now the converter window is open. Subtitles you've selected in the player are selected in the converter. 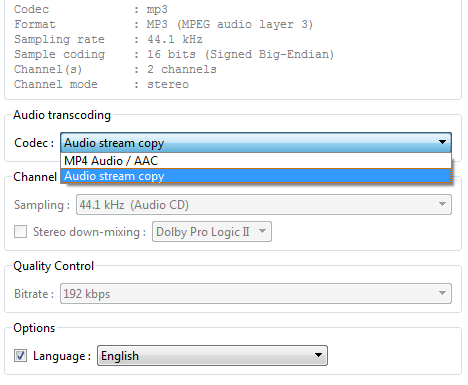 You can select/unselect additional subtitles streams you want to transcode. 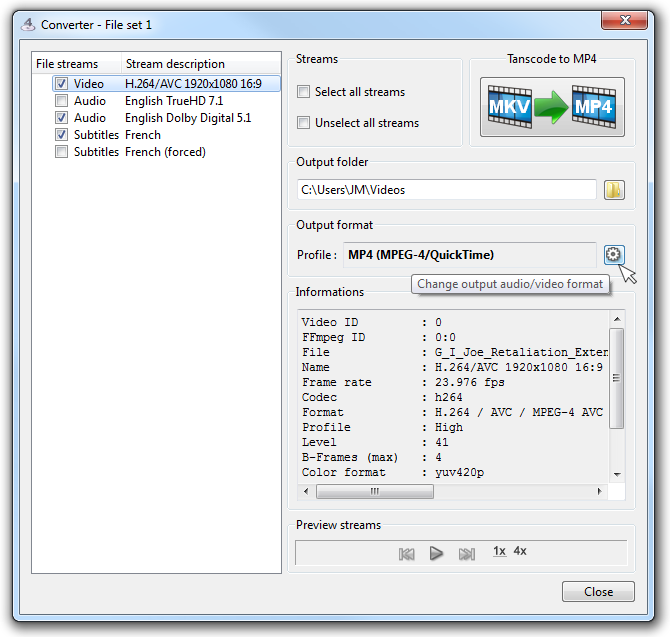 MP4 format support multiple audio streams and multiple text-based subtitles streams. Click the small gear wheel button to change output format. 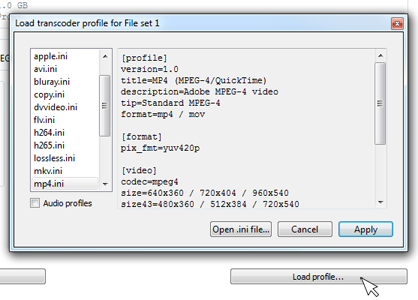 Profile field and Transcode to MP4 button give information about current output format (here beside MP4 profile for MOV/MP4). it is recommended to open the profile window and reload the profile .ini to ensure all settings are resetted. 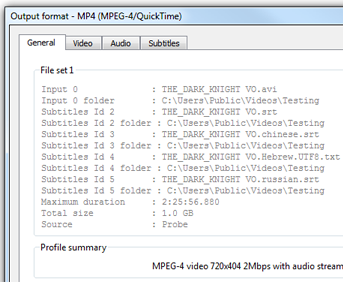 Now the output format window is open, click Load profile button and choose mp4.ini profile. Click Apply this profile for current File set. MOV - Apple QuickTime Movie is the preferred MP4 format for Apple. Advanced user can select 'User settings' level and tweak video and audio formats. 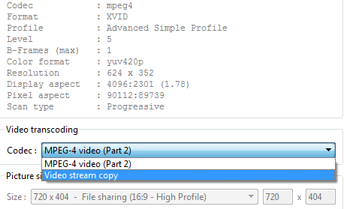 Video stream copy can be selected if your input movie has already a MP4-compliant video stream. Let unselected if scan type is Progressive. Select if scan type is Interlaced. Most movies are in widescreen format (2.35 or 2.40) which you can remove horizontal black bars (letterbox). You shouldn't have to change it, unless you want to correct a corrupted video (download movie with incorrect display size a.k.a. display aspect ratio). 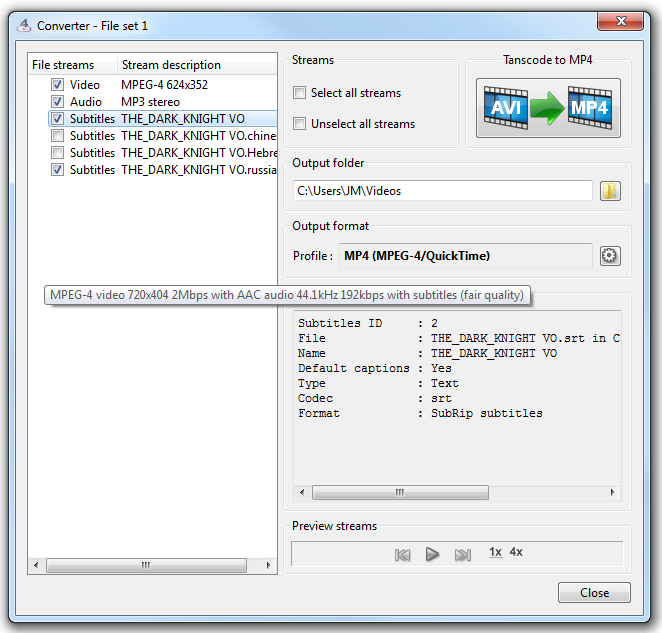 Audio stream copy can be selected if your input movie has already a MP4-compliant audio stream. 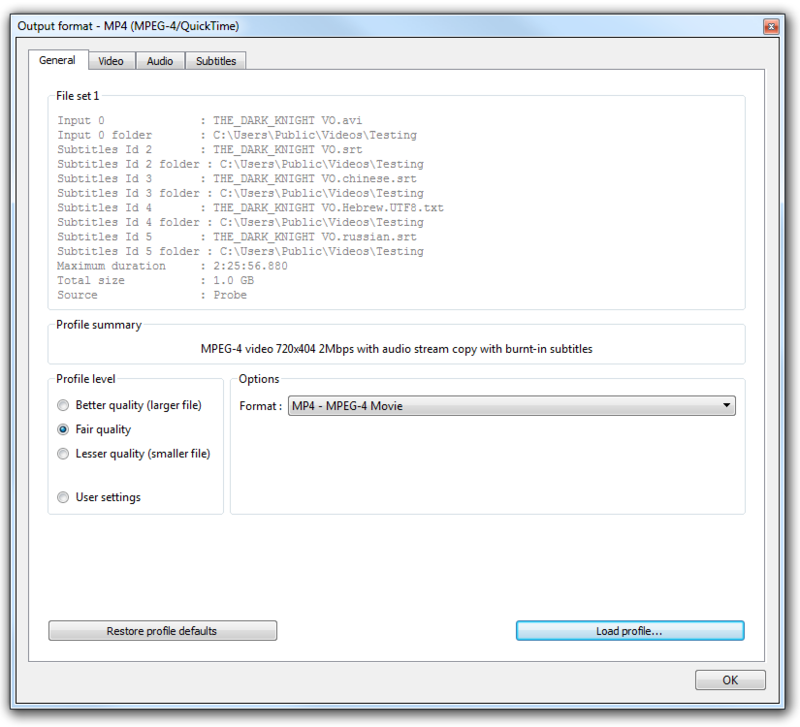 48.0kHz (High quality - DVD/TV) is the recommended audio sampling rate for MP4 movies. 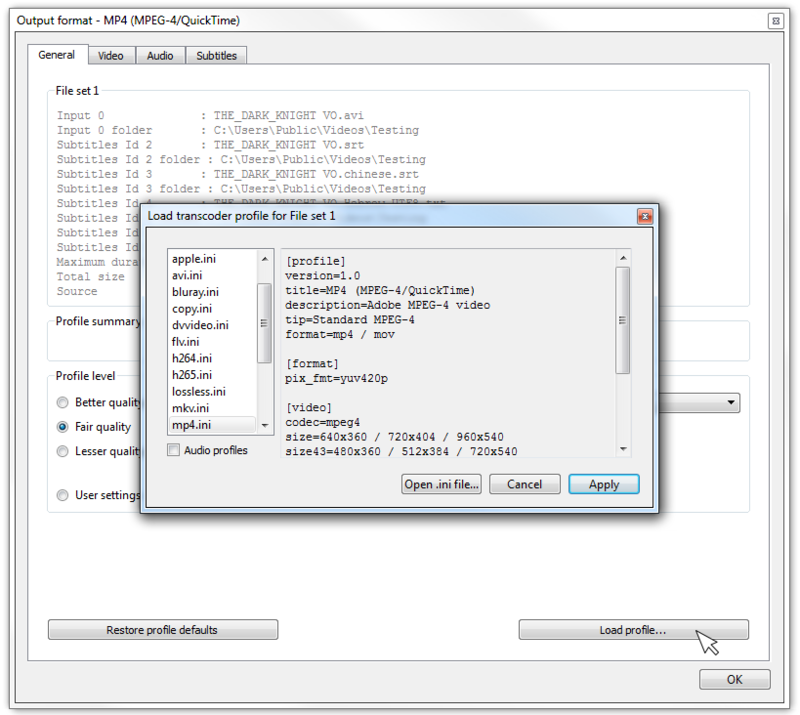 Nevertheless, if input sampling rate is compliant with the MP4 profile, there's usually no advantage resampling to another rate. Dolby Prologic II stereo down-mixing keeps best audio experience in stereo output. 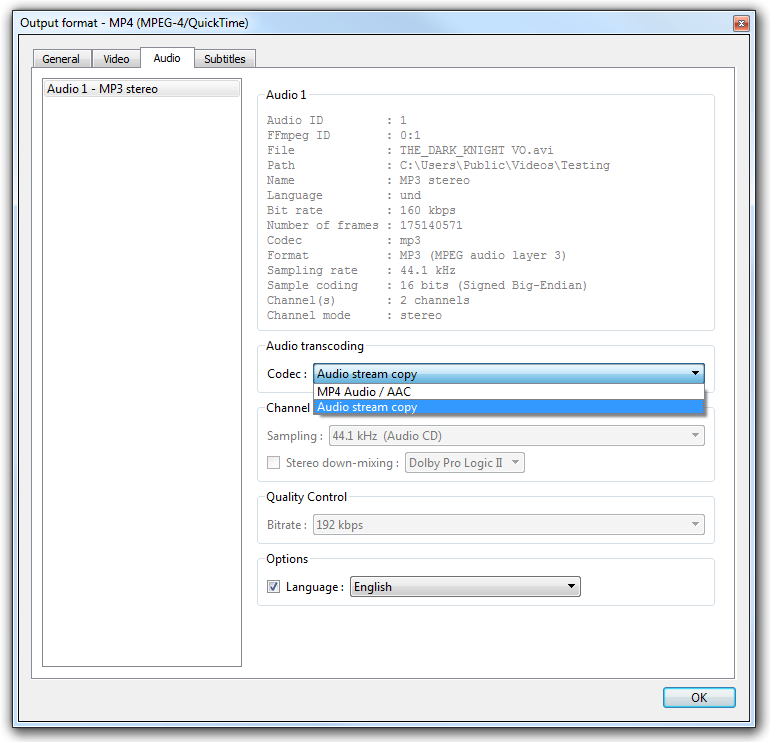 audio language is usually appropriately set in multi-audio tracks movies. 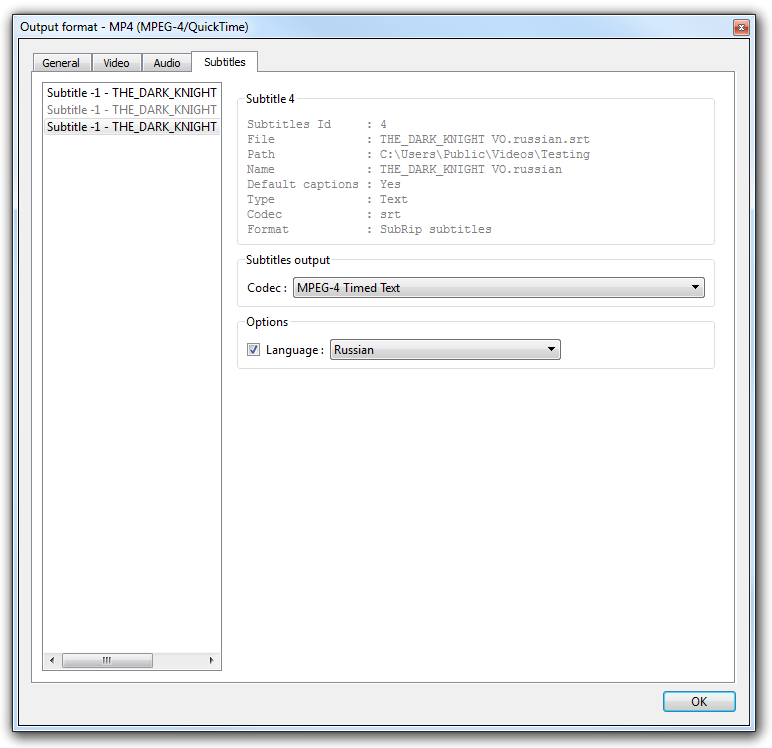 Subtitles text file available from the Internet are mostly in SubRip format (.srt) and MP4 movie format only support MPEG-4 Timed Text subtitles format. 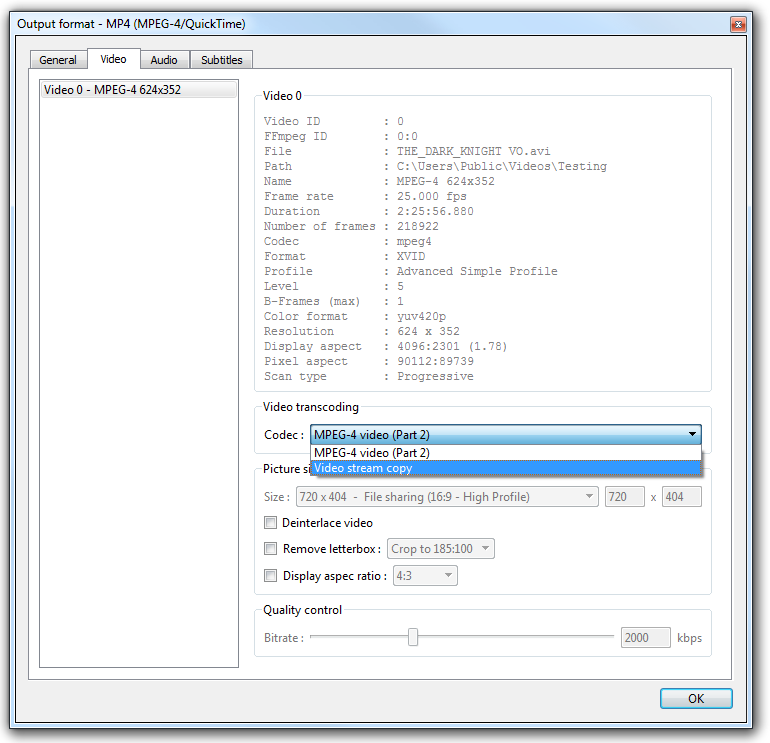 DVDx 4.1 can convert SubRip and SubStation Alpha subtitles to MPEG-4 Timed Text. 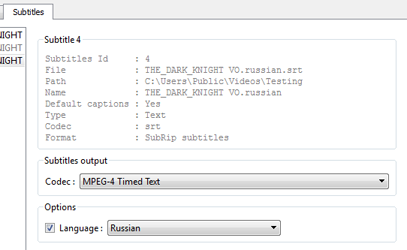 to create movie with permanent subtitles, choose Burnt-in subtitles codec. relevant option for subtitles track (set it appropriately). 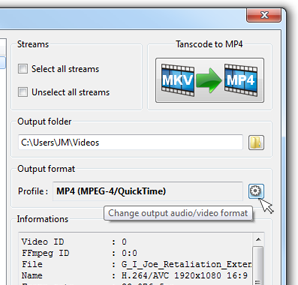 You're now ready to start transcoding, jut click the start Transcode to MP4 button and follow on the transcoding progression. Subtitles in non-Western languages (japanese, chinese, arabic, hebrew etc.) are encoded either in Unicode charset (UTF-8), either in particular coding (Shift JIS, CP737, Windows-1256 etc.). DVDx 4.1 handle perfectly UTF-8 and Western languages (ISO-8859, Windows-1252).